Millions of African households suffer some kind of correctable water problem. Hard water alone is found in 85% of all African homes. Other common water problems include excess iron, hydrogen sulfide gas (rotten egg smell), acidity, and cloudy water. Each of these problems can bring its own unpleasant effects into your home. Rusting and corroding pipes, clothing stains, bad tasting water, and higher water heating bills are just a few of the possible results of problem water, which can take money out of your pocket and affect the quality of your life. Chemicals that are dumped onto or pumped into the ground by industry can easily get into our water supply. There are an estimated 181,000 industrial waste sites, over 16,000 municipal landfills, and 100,000 ruptured underground gasoline storage tanks in the Africa that leak contaminants into our water supplies. Agricultural pesticides and pollution are among many other common practices that also can contaminate water. Water can become contaminated during its journey from the treatment plant to your home. Lead and asbestos-cement pipes, prevalent in municipal water distribution systems, can allow harmful substances to leach into the water. Even chlorine used to disinfect our water can react with naturally-occurring organic materials in water, such as from decaying leaves, and create Trihalomethanes (THMs), which are know to be carcinogenic (cancer forming) to lab animals and are suspected to be carcinogenic to humans. Water can become contaminated right at home. Some older homes have lead pipes or the plumbing systems use lead-based solder to join copper pipes. Both can allow lead to leach into drinking water. This results from suspended particles of dirt in water that make water appear cloudy. These particles usually are in two categories: larger, visible pieces that can easily be filtered out; and minute, invisible particles that can make water hazy. These invisible particles require a better filter to remove them. In addition to affecting the look and taste of water, particles can build up, and eventually clog, working parts of water using appliances, such as ice makers, irons etc causing them to break down. Approximately 85% of the country has hard water. Water becomes “hard” when it picks up calcium, magnesium and other minerals, such as iron, as it travels through certain types of rock and soil. These minerals can build up in appliances and pipes, restricting water flow. Hard water also leaves a sticky film on shower tiles and inhibits the lathering ability of soaps and detergents. Hardness usually does not adversely affect the taste of water. These tastes and odours are caused by algae, molds and bacteria that naturally live in most water sources, such as lakes and rivers. Water that is brownish in colour is caused by both the tea-like extracts of dead leaves, and by metals such as iron and copper. Unpleasant tasting and looking, this water also can stain sinks and laundry. Excessive iron and other metals in drinking water change the taste and appearance of water. Water can taste metallic even though it appears normal at first, turning “rusty” after a few minutes contact with air. Iron May foul plumbing lines and other water-using appliances; particularly noticeable as a yellow to reddish slime in toilet flush tanks. Dissolved iron in water converts from Fe2 to Fe3, and creates unsightly stains and health issues. Oxidising agents, media, and filtration. Acid Water Blue/green or rusty stains and corrosion of plumbing fixtures and other water-using appliances; pitting of porcelain and enamel fixtures and dishes. Pinholes in copper plumbing lines. Generally associated with water with a pH value of less than the neutral 7.0. pH 6.0 – 6.9 Neutralizing Filter pH 4.0 – 6.9 Chemical Feed Pump feeding soda ash Consult our Customer Service Dept. Aggressive / Corrosive Water Same symptoms as Acid Water but pH is 7.0 or higher. Alkalinity and carbon dioxide or high dissolved oxygen in water. Electrolysis – two dissimilar metals in plumbing lines. Consult our Customer Service Dept. Marshy, metallic or chlorine taste and/or odours Objectionable tastes and/or odours other than hydrogen sulfide. Dissolved minerals or gases; organic contamination or chlorination. Activated Carbon Filter for whole house water supply or Taste & Odour Cartridge Filter for individual faucets. Turbidity (Sand/Sediment) Foreign particles, dirty or cloudy water Tiny suspended particles that are the result of water main scale or silt. Private wells often contain sand or clay. Multimedia Filter for whole house water supply or a Sediment Cartridge Filter for individual faucets. Tannins Yellow or brown tint or cast in water supply; tannins measuring 0.5 PPM or higher may cause staining and/or interference with various water treatment processes. Result of decaying vegetative matter Organic Colour Removal Filter Consult our Customer Service Dept. As well as keeping you hydrated, water is a powerful cleanser – many toxins are flushed from the body in urine. While it certainly matters what and how much one drinks over the long term, it’s generally agreed that consuming the national average of at least 67 ounces of fluid each day (even more for those who are physically active) is important to one’s health. Adults and children can consume a wide variety of fluids each day, including water, milk, juices, teas, sports drinks and soft drinks to meet their hydration needs. For all the appeal beverages generate from a taste standpoint, it’s easy to forget they exist for an essential reason. The taste of water plays a major role in the amount of water people consume throughout the day. People and animals naturally drink more water when it tastes good. Beverages play a role as a component of a healthy lifestyle. So does overall diet, exercise, sleep, mental outlook and any number of factors. As with anything, beverages, depending on the type and quantity, can be beneficial when enjoyed in moderation. Proper hydration is critical to the function of the human body. Generally, healthy people can let thirst be their guide to adequate hydration. It is a myth that consuming caffeinated products dehydrates people. A recent report by the Institute of Medicine found that all beverages, including those with caffeine, help to hydrate the body. Active people and athletes need to hydrate themselves and replace electrolytes lost through sweat. Prolonged heat exposure and activity causes water loss and creates a need for fluid intake. Sport drinks may be a suitable beverage for these people. Water may also be used in healing. Some people believe water is a powerful messenger that can hold electromagnetic traces as a type of ‘memory’. This principle is applied in homeopathy, where it’s believed that the more a substance is diluted the more potent it becomes. However, this theory remains controversial. Waters from certain areas have historically been used for healing particular diseases and are often found to contain high levels of specific minerals that may help to relieve the condition. ‘Holy’ or ‘blessed’ water, either from sacred sites or blessed by spiritual teachers, is often highly prized – and some have prompted claims of miracle cures. Reverse osmosis was developed as a water treatment method more than 40 years ago. The process first arose as a technique of desalinating seawater. Once the method’s decontaminating capabilities were recognised, reverse osmosis systems began to be commercially produced for home water purification purposes. Such systems were installed in homes as early as the 1970s. Reverse osmosis is a more viable option to the more costly and energy-wasteful distillation units. Blue Steel Water Treatment manufacture and supply a full range of Reverse Osmosis systems to meet the demands of the domestic market. Products range from small point of use systems to larger whole house / industrial systems. For more information on the domestic water purifiers we have available download the product catalogue below. 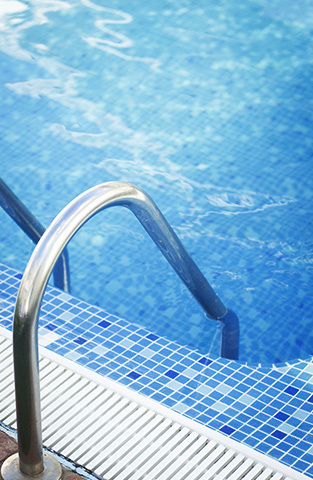 Chlorine ensures that harmful bacteria cannot develop in your pool. Unfortunately chlorine also has unpleasant side-effects on the people who swim in the chlorinated water. Children in particular do not realise that they must not get chlorinated water in their eyes because it will irritate them after swimming. Children with asthma also suffer greatly from chlorinated water, so that swimming can be less enjoyable for them. We have a new chlorine free product in development and will be posting information in the very near future.